Collecting a hatch from the loading station. Getting ready for a match - move the robot from the cart to the field to start another match. Team members at the 2019 Tech Valley Regional on March 7, 8, 9 2019. Driver Noah and Operator Asa practice on Tuesday Feb 19, 2019, using the line following sensors to line up robot with hatch and cargo collection and scoring areas. Destination: Deep Space - More auto programming a 2 hatch routine. College mentors hard at work. More work on the line follower sensors. The Competition Robot frame on the left and the Practice Robot frame on the right. Working on the line following sensors. Installing the chain drive system. Weight of the frame - 16.0 pounds. Smallest and lightest robot frame we have ever made. All girl robot frame assembly crew. So many parts and dimensions to check. The finished frame rail from the CNC Mill. Making parts on the CNC Mill. Still using the manual mill for many tasks. 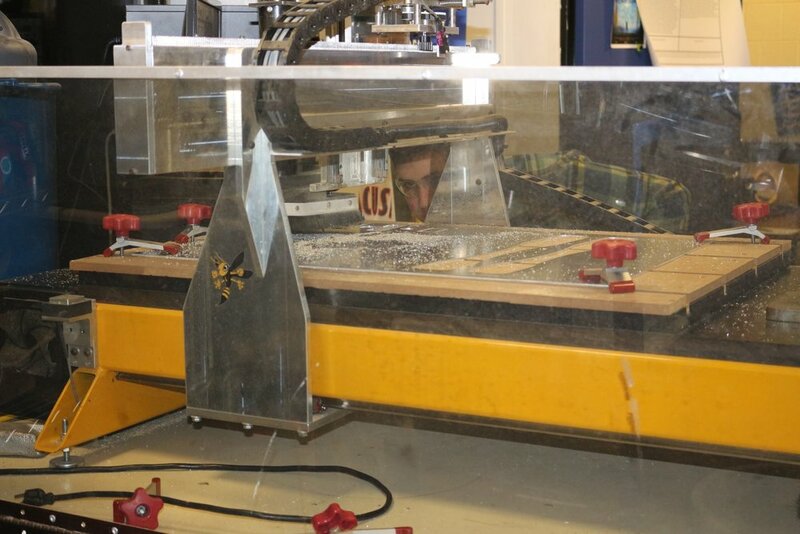 Working on the CNC Router. Albany, New York –The FIRST® Robotics Competition season is now underway, following the kickoff event held earlier this month, on Jan. 5. In the annual competition, teams of high school students must build a robot in response to a specific challenge, and members of Albany High School Team 1493 are geared up for the challenge. Inventor Dean Kamen founded FIRST (For Inspiration and Recognition of Science and Technology) in 1989 to inspire an appreciation of science and technology in young people. Based in Manchester, N.H., FIRST® designs accessible, innovative programs to build self-confidence, knowledge, and life skills while motivating young people to pursue opportunities in science, technology, and engineering. Kamen launched the 2019 FIRST® Robotics Competition season to announce a new robotics game called DESTINATION: DEEP SPACE Presented By The Boeing Company before a crowd of 1,200 people, including New Hampshire Governor Chris Sununu and U.S. Rep. Chris Pappas (D-N.H.) at Southern New Hampshire University in Manchester, New Hampshire, hometown of FIRST Headquarters. Nearly 100,000 high-school students on 3,790 teams at 146 venues around the globe joined the 2019 Kickoff via live broadcast. The 2019 challenge, DESTINATION: DEEP SPACE Presented By Boeing, finds teams collecting samples on Planet Primus. Two competing alliances will combat unpredictable terrain and weather patterns, making remote robot operation essential to their mission on the planet. With only two minutes and thirty seconds until liftoff, the alliances must gather as many cargo pods as possible and prepare their spaceships for departure before the next sandstorm arrives. Working with adult mentors, students will have up to six weeks to design, build, program, and test their robots to meet the season’s engineering challenge. Once these young inventors build a robot, their teams will participate in one or more of the global 173 Regional and District events that measure the effectiveness of each robot, the power of collaboration, and the determination of students. This year, members of Albany High School Robotics Team 1493, will join 35 other teams of high school students from the Capital Region, New York state, New Jersey, Canada, and Brazil to participate in the annual competition. In its sixth year, Rensselaer Polytechnic Institute will once again host the New York Tech Valley FIRST Regional competition, March 6-9, on the Rensselaer campus in the East Campus Athletic Village. During the 2019 season, nearly 100,000 high-school students on 3,800 FIRST Robotics Competition teams will compete in 100 District Events, 11 District Championships, and 62 Regional Events (in the U.S., Australia, Canada, Israel, Mexico, and Turkey), and the FIRST Championship. Teams are comprised of professional mentors and 10 or more student members in grades 9-12. In addition, each FIRST team has one or more sponsors. Team 1493 sponsors include: Rensselaer Polytechnic Institute, GH Foundation, Albany City School District, Center for Automation Technologies and Systems at Rensselaer Polytechnic Institute, New York State Office of Science, Technology, & Academic Research (NYSTAR), International Brotherhood of Electrical Workers, CAP COM, CDPHP, Turner Construction Company, South End Powder Coating, Greenman-Pedersen , Inc., Hesnor Engineering Associates, ASME, Phillips Hardware, Price Chopper, Stewarts Shop, Albany Booster Club, and Harbor-Freight Tools. Founded in 2003, Team 1493 had its humble beginnings with seven members and two Albany High School advisors. Today, the after-school program is now home to more than 40 students from diverse backgrounds. The mission then, which continues today, is aligned with the vision of FIRST® (For Inspiration and Recognition of Science and Technology), the world’s leading child-serving nonprofit advancing science, technology, engineering, and math (STEM). A very successful day at RPI, all 3 robots made the finals and the robot driven by Brodey and built and designed by Gilad and his team won the event, another trophy for the display case. Great job team!! Brodey and the winning robot. We had a great time at Championships!!!!!! We had so much fun in Detroit for the 2018 Championships!! This was the first time we have ever gone as regional winners!!! While we didn’t win big at the Championship we learned a lot and had a ton of fun!!! Thank you to all our sponsors, we wouldn’t have been able to get to Detroit without all your help!!!! We are looking forward to a great season next year!!!! We are this years Tech Valley Regional Champions!!!! For the first time in team history we have won a regional!!! The team is so excited we performed so well and we are ready to head to the Championship to compete! !